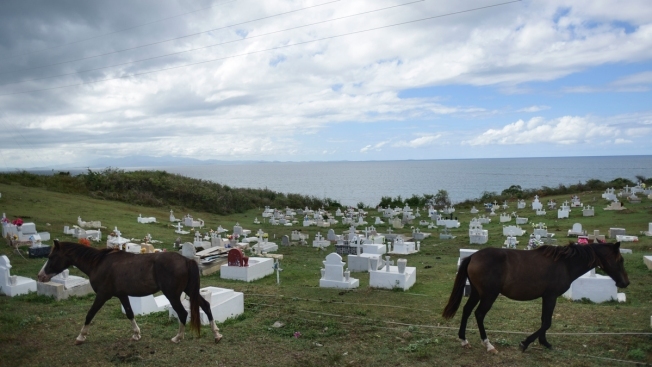 In this Sept. 8, 2018 photo, horses walk through the municipal cemetery where several dialysis patients who died in the aftermath of Hurricane Maria, are buried in Vieques, Puerto Rico. Of the 15 patients with kidney failure who lived on the tiny island before the storm, six have died since they began there thrice-weekly trips to the Puerto Rican mainland for dialysis treatments because the only treatment center on the island was shuttered by Maria. As weeks turned into months, the seats of the small plane began to empty out. In the beginning, 15 passengers flew from Vieques to the Puerto Rican mainland — refugees from Hurricane Maria. The storm had ruined the only dialysis center on this tiny island, their home; without treatment, the kidney patients from Vieques would die. The mortality rate is "a high number," said Angela Diaz, director of the nonprofit Renal Council of Puerto Rico. "We obviously cannot dismiss the fact that these are not appropriate conditions. It's vital that (the government) take action as soon as possible. ... As much as they want to avoid the topic, we have to talk about how we're still doing this one year after Maria." 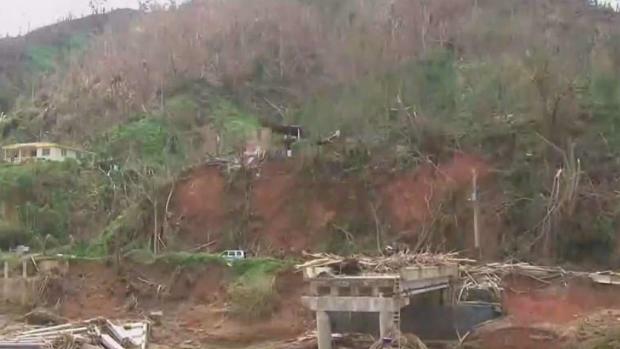 One year ago, the mountain town of Utuado, Puerto Rico was left isolated after the only bridge connecting the town to civilization was destroyed by Hurricane Maria. News 4's Darlene Rodriguez returns to the community one year after she first visited the region. As dire as the situation may be, it could get worse. A mobile unit, purchased by federal officials to provide dialysis on Vieques, is stuck more than 3,000 miles (4,800 kilometers) away, in California; the Renal Council, which is paying for the dialysis flights, says it will run out of money to do so by month's end. "If they take away our flights, we will end up dying," said Elias Salgado, a 56-year-old renal patient who is diabetic and suffers from high blood pressure. "There are not many of us left." The Vieques dialysis center was located in the island's only medical clinic. The building still stands, though it is heavily damaged and strewn with horse manure. Weeks after Maria hit, health officials declared it contaminated and ordered that it be demolished. 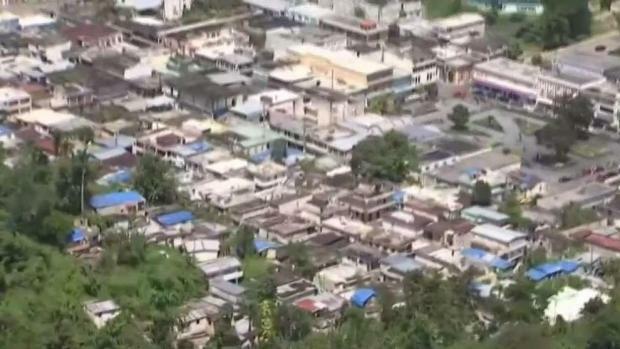 The one year anniversary since Hurricane Maria made landfall on Puerto Rico has come and now crews are surveying the damage that still remains. Ray Villeda reports. "You don't get used to this," chimed in Edwin Alvarado, a 59-year-old dialysis patient who also has high blood pressure and had open heart surgery five months after Maria. Before Alvarado got a chance to sit down at the airport's waiting room in Vieques on a recent Saturday, the paramedic intercepted him. He wrapped a cuff around Alvarado's bicep and took his blood pressure: "It's high," the paramedic warned, "180 over 110." 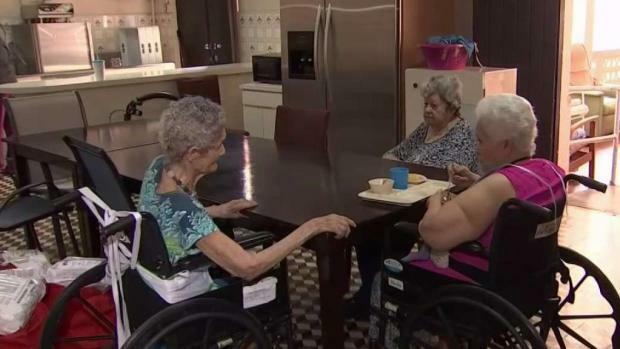 For hurricane victims inside a Puerto Rican nursing home, it was one thing Maria couldn't wash away that helped them stay alive one year ago. Ray Villeda reports. Alvarado shrugged. Like Salgado, he'd love to move to the U.S. mainland and live close to a dialysis clinic, but he has nowhere to stay and cannot afford to leave Vieques and find somewhere new to live. Salgado has another reason to stay: He's on Puerto Rico's transplant list. "I could be called at any moment," he said. "Sometimes you come out of treatment dizzy, vomiting," said Rivera, who is seeking a spot on the transplant list. The mother of an autistic child, she is forced to skip two days of work every week because of the flights. She smiled slightly and confided that she's a nervous flyer, and that sometimes she loses hope. "We go through a lot," she said. "Behave," one airport worker told her as he smiled and closed the plane's door. Salgado's doctor, Jose Figueroa, worries about the effects of such exhausting travel. He likens it to insisting that someone walk home after running a marathon. "Eventually those patients, who already are fragile, will keep worsening," he said. A year of this, he said, was "unacceptable." Argeo Caraballo, 70, died of heart failure on Feb. 13. "The trips were way too exhausting," said his daughter, Gladys, who traveled with him and found the trips grueling, as well. "He completely deteriorated after Maria." Hector Serrano, 57, was co-pastor of a Vieques church. He died in mid-August of cancer and other ailments. Said his sister, Magali Rivera: "It's a crime what they're doing to these renal patients. ... He (Hector) would have been by our side for longer." Luis Emanuelli, a vice president at Fresenius Kidney Care, said the company has long been ready with the equipment and staff needed to resume treatment in Vieques under an agreement with Puerto Rico's health department, which has to provide a licensed facility. The company is committed, he said, to "resuming operations as soon as there is a suitable location for us." But patients say they have waited long enough and want Puerto Rico's government to deliver on its promises. "It's an injustice to have us like this" — flying back and forth for treatment — "when they can put a clinic here," Medina said. "Where is the conscience? Where is the humanity?" Cruz asked, tearing up. "It's always, 'We don't have the money, we don't have the money, we don't have the money.' But they're putting at risk lives that we could prolong."